I didn’t know Wink personally but I have come across her during my blog wanderings and was touched to read her story on the lovely blog by Kathryn of Crochet Concupiscence. Kathryn has started this #MandalasForMarinke project as a tribute to Wink’s life and as a way of raising awareness of the debilitating illness that is depression. Wink used crochet as a way of managing her depression but tragically took her own life a few weeks ago, which is just so desperately sad. 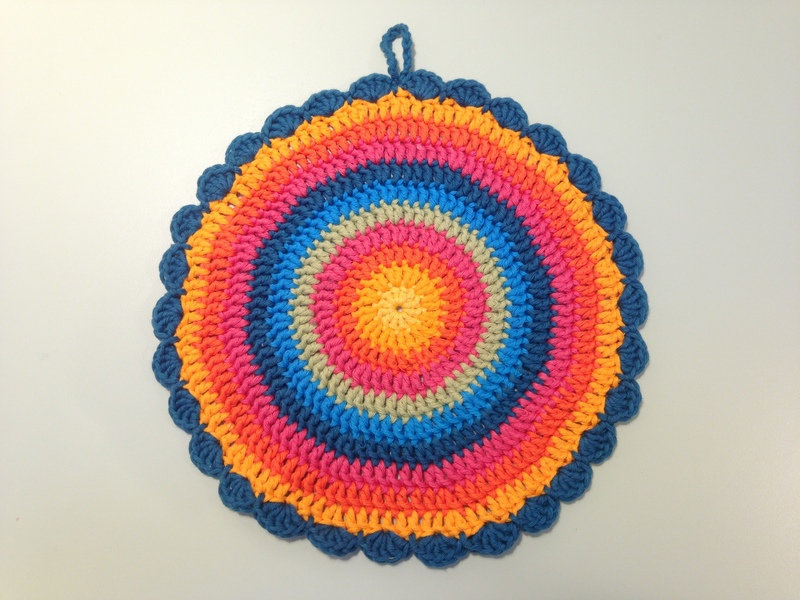 The aim of the project is to gather mandalas and stories from the crochet community across the world and bring them together in what I imagine will be a glorious explosion of colour and collective crochet love. I made my mandala to one of Wink’s patterns. I chose her basic mandala pattern because, although she designed a range of much more intricate mandala patterns, this one sings out to me in its simplicity. There is something in the simplicity of crochet that really appeals to me and I love the fact that, with a couple of simple stitches under your belt, you can make so many things. I also wanted to make it colourful, which it is. I don’t make colourful things very often (when I do they are usually children’s toys) but I have to say that I really enjoyed putting these vibrant colours together. I also learned that it pays to think about the colour order in advance! My first attempt used the same colours but just in the order that I pulled them out of the bag, and I have to say that it looked fairly horrible. I am not even going to show you, it was that rubbish.I like this version because it looks like it has a warm, glowy sunburst at its centre. There are many stories out there in blogland of people who find crochet a therapeutic activity and one that is vital to maintaining their mental health. I would put myself in this group and, having tried very many crafts from spoon carving to sewing to writing, crochet is the one that has stayed with me and calms my noisy thoughts. I have always known that I need to make stuff in order to stay sane and there is something about the hook and yarn that I find both relaxing and exciting because the possibilities actually are endless. I know that I will never be physically able to make all the crocheted items that are on my wish list and range from woolly taxidermy and spectacular yarn bombs, to clothing and home furnishings. I haven’t had a serious bout of depression for some years now although I am always aware that it lingers somewhere behind me and from time to time it sneaks to the front. Suicide and the devastating effect it has on families is also something that is painfully real in my life, having lost my youngest cousin in this way seven years ago. And so, if making a pretty thing out of yarn and sharing it with the world can raise even the tiniest bit of awareness of how important it is to recognise and treat depression properly, then I think it is well worth it. So this mandala will now be making its way across the ocean to San Francisco to join its friends….Bon Voyage.